Drawing on technologies developed over a history of 100 years, the Hodogaya Chemical Group is carrying out R&D across fields ranging from basic chemicals to the latest imaging materials. The Group’s R&D projects are tailored to the specific requests of its customers and are designed to respond quickly to the increasingly diverse needs of society. By applying the skills and expertise it has refined over many years in research projects covering a wide spectrum of industries, the Group can develop industrial technologies and products with all-new functions. By pursuing original R&D with a future outlook, the Group intends to expand its businesses while bringing benefits to people everywhere. Highly purified raw materials that can be used in new fields and for constantly evolving applications are always in demand. 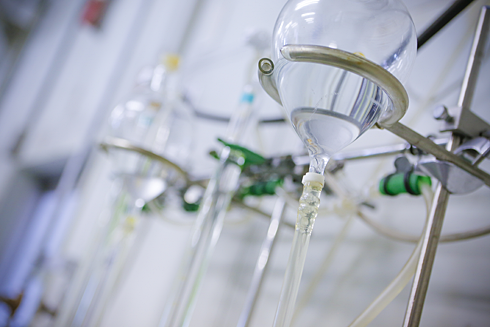 The Hodogaya Chemical Group applies its advanced refining technologies to meet extremely strict technical requirements that exceed clients’ expectations. The Hodogaya Chemical Group aims to help people fulfill their hopes for lifestyles that are safe, secure, comfortable, and enriching. With this in mind, the Group offers new materials that feature a wide array of functions, while striving to open up all kinds of fresh possibilities for their use. The Hodogaya Chemical Group’s products are trusted by customers for their highly renowned technologies.